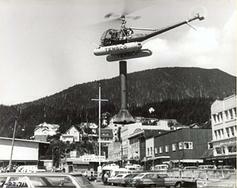 History | Temsco Helicopters Inc.
TEMSCO (an acronym from the words: Timber, Exploration, Mining, Survery, Cargo Operations) was founded in 1958 in Ketchikan, Alaska. Airplanes had been used in Alaska for decades before TEMSCO placed helicopter’s in Alaska in the 1960’s. The terrain and type of work in Alaska is perfectly suited for the helicopter and TEMSCO Airlines (as it was known long ago) realized the time was right to introduce helicopters into its fleet of aircraft. 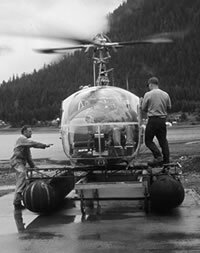 Founder of TEMSCO and Alaska Aviation Pioneer, Ken Eichner proved that helicopters were an invaluable tool for the rugged and remote terrain of Alaska. He became the President of the company in 1965. Eichner built the company into one of the most successful helicopter companies in Alaska. Through countless search and rescue missions in the 60’s, 70’s, 80’s, and 90’s, Ken Eichner and other TEMSCO Pilots became saviors to many who might have perished were it not for TEMSCO. Flying injured loggers, lost hunters, or scooping up overboard fisherman with the helicopter (utilizing a device that Ken Eichner helped invent) was a task TEMSCO is still completing successfully to this day. TEMSCO Helicopters has expanded its operation into tourism, hospital transport, firefighting, international, and other growing markets. Since Ken Eichner’s retirement in the early ’90s TEMSCO continues his vision of service and dedication to the community. Ken Eichner’s grandson is now Chief Pilot at TEMSCO Helicopters, Inc. helping to ensure the wisdom and practical knowledge is passed down to new generations of TEMSCO Pilots and Mechanics and ultimately making the safety and job efficiency a priority for TEMSCO’s Customers. © 2019 Temsco Helicopters Inc.